POS Displays are on the market in many different designs, purposes and materials. 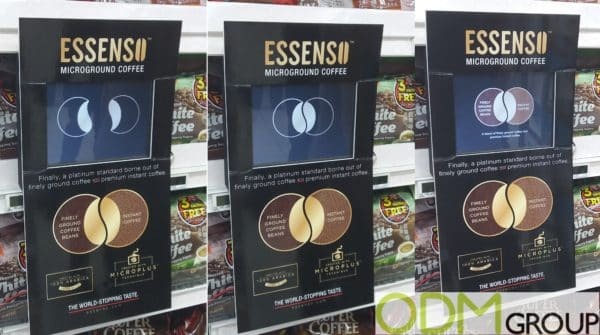 The design used by Essenso has actually a video display inserted in it, which will catch the eye of your current and potential clients to prefer your brand and products. Show the history and special qualities of your product on this branded video POS display and make sure to reach your target groups. This branded video POS display shows the client how the brand got to its label as well as its communicating the company image. The cardboard around the video display also explains more information about the brand and product and is therefore a great additional characteristic to the LCD display. Such a custom POS display is always a good way to catch the attention of your customers and influence them to prefer your brand. The materials and design is totally customizable to your brand and is because of this a great way to promote any brand and product, you like. Also is the video display reusable, so you can suit it to your marketing campaign whenever you want to change it. The cardboard around the display is also easily remove- and changeable, so you can update it to any new marketing campaign. Why should you think about such a Branded Video POS Display? Brand awareness. Catching the attention by your customers with such a video POS display on the shelf in a supermarket will affect your customer for a long term and will make him prefer your brand instead of your competitors. Additional Customers. Current and potential customers will learn more about your company, brand and product, while watching this short video and will want to try how it tastes. At ODM we have significant experience in product design, sourcing and manufacturing. We can help you with your marketing budgets effectively. Be sure to contact us if you are interested in finding out more information about such a branded video POS display. Please find POS Display related blog links below.